The Scottish Schools Pipe Band Championships has been hitting the headlines in Dundee as schools from across the city come together to enter the competition. Following the success of the inaugural championships, organisers hope that the event will be even bigger and better in 2014 when it takes place on March 9 at Broughton High School in Edinburgh. Keen to pipe up for the championships, pupils from schools in Dundee including Craigie High School, Grove Academy, Harris Academy, Menzieshill High School, Morgan Academy and St John’s RC High School have formed a band under the instruction of Pipe Major Derek Potter who has previously enjoyed life as the Queen’s official piper. Rehearsals are already well under way and the band look forward to competing in the championships. Schools still have time to enter the competition and for more information please see the official website http://www.scottishschoolspipebandchampionships.com/. 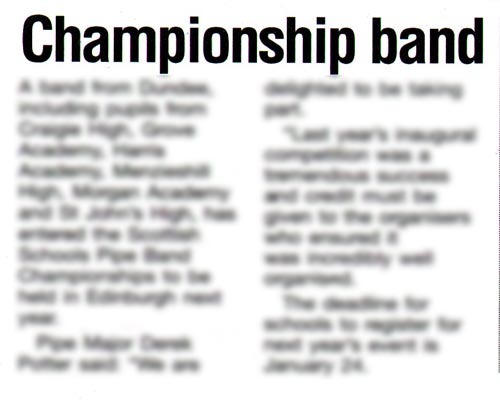 The coverage was achieved as part of an ongoing PR campaign for The Scottish Schools Pipe Band Championships. If you would like to find out more about how quality public relations can help boost your project or business, get in touch with a member of our friendly team today.